COOPERSTOWN, N.Y. (AP) — The work of famed celebrity and fashion photographer Herb Ritts is going on display at an upstate New York museum. NEW YORK (AP) — Pegi Young, who with fellow musician and then-husband Neil Young helped found the Bridge School for children with speech and physical impairments, has died. On "The Other Shore," Murder By Death challenges the preconception that Pink Floyd, David Bowie and Richard Strauss are what's usually playing in outer space. LONDON (AP) — Influential British dancer, choreographer and mime artist Lindsay Kemp, known for tutoring singers David Bowie and Kate Bush during his career, has died at 80. Director Nendie Pinto-Duschinsky, who is making a documentary called "Lindsay Kemp's Last Dance," said Saturday that Kemp died suddenly after a "perfect" day rehearsing with his students. He was about to work on his memoirs and to go on tour, she said. Tom Bailey uses those same elements of the band's identikit on "Science Fiction," a sprightly musical collection with a glossy finish where feelings of unease and being adrift lurk beneath. NEW YORK (AP) — Musician, producer and composer Nile Rodgers has a new role as chairman of the Songwriters Hall of Fame. Board members on Monday unanimously elected the 65-year-old guitarist. Rodgers will serve a three-year term, succeeding co-chairs Kenneth Gamble and Leon Huff, known as Gamble & Huff. In a statement, Rodgers says he will try to serve "with all my heart." Former R.E.M. guitarist Peter Buck and often-experimental singer-songwriter Joseph Arthur have teamed up for an album that was written mostly in a few days after a chance encounter in Mexico and recorded nearly as quickly. Fresh and spontaneous, it's also filled with precious sonic details, like little flashes sparking the songs. There are excellent records about death, dying, grief and goodbyes — from Neil Young's "Tonight's the Night" and David Bowie's "Blackstar" to The Antlers' "Hospice" and Gord Downie's "Introduce Yerself." Jennifer Castle's "Angels of Death" is an ethereal, deeply poetic take on the subject — nimble, sure-footed and beautifully written and performed. NASHVILLE, Tenn. (AP) — The maker of the Gibson guitar, omnipresent for decades on the American music stage, is filing for bankruptcy protection after wrestling for years with debt. A pre-negotiated reorganization plan filed Tuesday will allow Gibson Brands Inc. to continue operations with $135 million in financing from lenders. Nicole Murray loved Wawa and David Bowie and taking selfies – that much one can discern from her Facebook page. Jim Henson's cult classic Labyrinth, which famously starred David Bowie as the Goblin King, will return to movie theaters April 29th, May 1st and May 2nd. CLEVELAND, Ohio - Just like the merch we buy at concerts, souvenirs and keepsakes help us always remember a special night. For this year's Rock & Roll Hall of Fame inductions, Northeast Ohio artists added their personal touches to mugs, notecards and more. We talked to Shari Escott and Cathy Strauss of Paper Cutz and Leandra Drumm about what went into making their Rock Hall creations. CLEVELAND, Ohio -- On May 5, 1986, Cleveland leaders rolled the dice for one of the greatest civic gambles in the city's history. That's the day that Cleveland was named the site for the Rock & Roll Hall of Fame and Museum, beating out a particularly aggressive Memphis as well as entertainment capitals such as New York and Los Angeles. NEW YORK (AP) — You're on the couch. It's been a long day. The remote control is in your hand. What can you watch? There's that new CNN documentary series on the pope. Or maybe you're more in the mood for some sinners in "Girls Incarcerated" on Netflix? There are cute critters on Hulu's "March of the Penguins 2: The Next Step" or you could watch former slugger David Ortiz as he figures out his next career step on Fusion. Family: Daughters Cactus and Whimsy Lim. Occupation: Service Coordinator, Sutter County Library. What’s your walk-up intro music? “Let’s Dance” by David Bowie. Hobbies, interests: Books, biking, art and Kenpo karate. What brought you to the Yuba-Sutter area? Born and raised. What do you like about the Yuba-Sutter area? We are close to everything – one hour to the mountains, two hours to the ocean, one hour to a larger city but still in a great community. The great Bowie wrote the song in 1971 as a symbol for kids then and how they were the future. It made sense since it came at a time when there was growth in how teens viewed politics, race, Vietnam, etc. One day a year, vinyl fans across the country flock to their nearest record store with a list in hand of limited edition records they hope to add to their collection. This year, Record Store Day falls on April 21, and the complete list of releases, which was announced earlier this week, features some gems. 2018 Record Store Day Ambassadors Run the Jewels are looking out for fans, releasing a Stay Gold metal box for them to house their Run the Jewels record collections. NEW YORK (AP) — A highly anticipated New York City museum show highlighting the life and work of David Bowie will feature exclusive perks for those willing to pay $2,500 for a ticket. As bandleader for the Celebrating David Bowie Tour, keyboardist Mike Garson is doing a lot of juggling. Lets see whos playing in Minneapolis, he said as he checked his notes the other day en route to an airport. On Feb. 6, Bob Lambert watched the Space X Falcon Heavy hammer its way into space. He saw its two side booster rockets return in perfect synchrony a few minutes later. If you want to dream of sunnier days ahead, imagine lilacs blooming and rolling hills covered in fragrant lavender. Then mix in a little Prince and David Bowie, and meditate on just how you can infuse some of this visually stimulating color palette to everyday life and everyday wardrobe. It's time to add a breath of fresh lavender and get into the spirit of a new season. CLEVELAND,Ohio -- SpaceX and Tesla CEO visionary Elan Musk floored it into a new frontier, launching a Tesla roadster into orbit and returning two reusable booster rockets with simultaneous touchdowns. Both the orbiting car and rocket touchdowns were visual marvels and just downright cool. CLEVELAND, Ohio -- He was a singer, a spaceman and a cosmic hero. And two years after his death, his songs, spirit and style continue to inspire. Roll out the David Bowie Tribute -- Friday and Saturday at the Bop Stop, 2920 Detroit Ave., Cleveland. NEW YORK (AP) — After British filmmaker Francis Whately captured David Bowie in his 2013 film, "David Bowie: Five Years," he thought documenting the life of his musical hero was complete. Turns out he was mistaken. 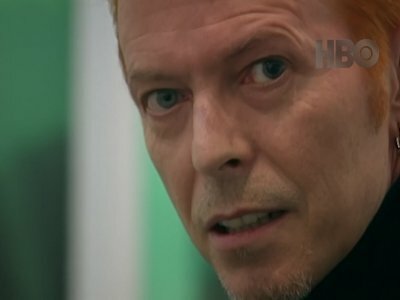 The end of Bowie's life was equally interesting to Whately as he centers on the artist's final projects in the new HBO documentary, "David Bowie: The Last Five Years." It started airing this week, which marks two years since Bowie died at age 69. David Bowie's 'Let's Dance' demo has been released to mark his 71st birthday (08.01.18). An early version of the track from the late music legend's 1983 record of the same name was mixed after Chic star Nile Rodgers took a trip to the 'Starman' hitmaker's old house in Blonay, Switzerland, to work on music with his friend. Erdal Kizilcay and engineer David Richards then joined the pair at Montreux's Mountain Studios to get it finished. Saxophonist Donny McCaslin and keyboardist Jason Lindner, who are known for their performance on rock legend David Bowie’s final album “Blackstar,” performed an eclectic free-form jazz show at Greenwich Library’s Cole Auditorium on Sunday. McCaslin and Lindner comprise half of the Donny McCaslin Quartet, the ensemble that backed David Bowie on his final album “Blackstar,” which debuted at number one on the Billboard charts shortly before Bowie’s death in January of 2016. Trailers for the Sandra Bullock-led Oceans 8 have me itching to re-watch 1996s Set It Off (6 p.m., BET), in which another all-star team of actresses Queen Latifah, Kimberly Elise, Vivica A. Fox and Jada Pinkett Smith lead a riveting life of crime. For a female gang interested only in stealing laughs, you cant go wrong with 2011s Bridesmaids (7:30 p.m., Freeform), the irresistible comedy that made Melissa McCarthy a star. GREENWICH — Donny McCaslin has had a whirlwind few years. In January 2016, David Bowie’s final album, “Blackstar,” enjoyed a worldwide release. And it was McCaslin’s saxophone that bellowed in the background. Only months later, in October 2016, he launched his own record in tribute to Bowie, “Beyond Now.” And since “Blackstar,” he often tours with his group, the Donny McCaslin Quartet. Sir Ike got it right. Each year, we lose celebrities and public figures we’ve come to enjoy – who sometimes even feel like family. We let them into our homes through TV, see them countless times on the big screen, sing along with them, and more. Tom Petty wasn't as charismatic as Prince. He didn't have the fashion sense of David Bowie. He wasn't as influential as Fats Domino or Chuck Berry, or as effervescent as Glen Campbell. But Petty's death on Oct. 2, 2017, was deeply felt by fans and musicians who can't remember what life was like without his music. Forty years ago, a flamboyant rocker from London picked up the sheet music for “Little Drummer Boy” and kick-started a strange seasonal duet with Spokane’s most famous crooner. “This one, this is my son’s favorite. Do you know this one?” David Bowie asked, in a scripted exchange with Bing Crosby on what became the radio age superstar’s final Christmas TV special. “Oh, I do indeed. It’s a lovely thing,” the sweater-clad septuagenarian replied. "The whole floor was a pit," says Chris Baccaro of an epic concert by Nine Inch Nails at the tiny Numbers nightclub in Montrose on Nov. 4, 1995. Now 44 years old, the service manager at an area Ford dealership speaks about the show in mythic terms, like many Houstonians who found themselves covered in the sweat of others that night. Why do you think former Tricentennial Commission CEO Edward Benavides chose Pat Benatar and REO Speedwagon to headline San Antonio’s 300th birthday kickoff? A. He wanted two acts that were relevant when San Antonio was founded. B. Keith Emerson, Jerry Garcia, Doug Sahm and David Bowie were booked. C. He thought this was the practice run for the next time San Antonio celebrates its 300th birthday. Just a few pages of the more than 500 in this beguiling new oral biography of David Bowie address the singer’s apparent lifelong devotion to Buddhism. But the testimony on those pages would seem a crucial key to Bowie’s fantastic success, his phenomenal ability to re-create himself time and again over a half-century as rock music’s biggest enigma. NEW YORK (AP) — Grammy winner Paul Buckmaster, who arranged and orchestrated some of the best-known songs of David Bowie, the Rolling Stones and Elton John among others in a career that spanned a half-century, has died. He was 71. His assistant, Diana Post, says Buckmaster died on Nov. 7 in Los Angeles. She didn't mention the cause of his death. U2 paid tribute to the victims of the Manchester terrorist attack at a special London concert on Saturday (11.11.17) night. The Irish rockers kicked off their MTV Presents Trafalgar Square gig at the famous landmark by performing 'Sunday Bloody Sunday', with the names of those who had lost their lives when a bomb was detonated at an Ariana Grande concert in Manchester Arena in May were lit up on huge display boards.